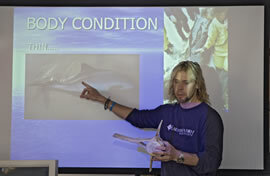 Learning about whales and dolphins during a CRRU seminar. Whale rescue demonstrations for the public at an Aberdeenshire show. The CRRU conducts an assortment of public talks and visits during the year, both within the local and wider community, for enthusiast groups and voluntary organisations (provided on a donation basis), and under commission or in partnership with visitor centres and public/corporate bodies at locations throughout the country, depending on our itinerary. These talks can be formal or informal, and can be geared to suit an audience of any background or age group. Find out how dolphins and whales communicate; what dolphin 'midwives' and 'nannies' are; how dolphins can "X-ray" each other; and how dolphins and whales evolved. Subject material is diverse and specific topics and themes for talks are available by arrangement. 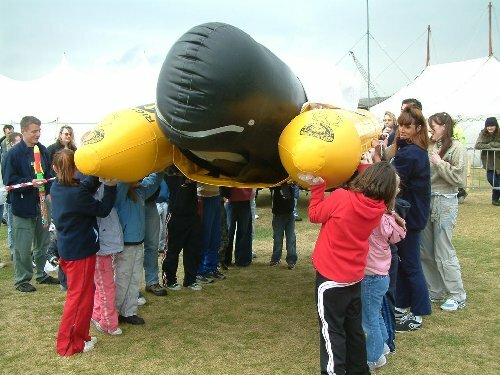 Whale rescue workshops and demonstrations are also a very popular request for groups of all ages and backgrounds.